Big Bend National Park is very large and remote. Remember that you will be at least 100 miles from a bank, hospital, pharmacy, or supermarket. A minimum of two days is needed to see most of the park from the main roads. For hikers and explorers, allow a week to see the park. A high clearance or 4x4 vehicle will allow you to see more of the park. Camping, birdwatching, wildlife viewing, and float trips are popular park activities. Commercial float trips on the Rio Grande are available through outfitters just outside the park. Special use permits for commercial filming and other activities are arranged on an individual basis. For additional information on special use or filming permits, call 915-477-2251. There are several paved roads that give the visitor an introduction to the park scenery. The Ross Maxwell Scenic Drive to Castolon and the road to the Chisos Mountains Basin are not recommended for trailers over 20 feet, or RVs over 24 feet. Numerous dirt roads, suitable only for high-clearance vehicles, are located throughout the park. 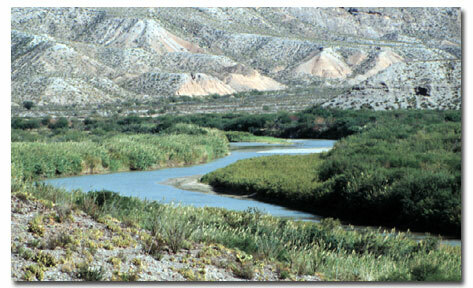 Fishing is allowed in the Rio Grande River. No license is required. Catfish are common. Swimming is neither prohibited nor encouraged in the Rio Grande River. Beware of strong undercurrents and dropoffs. The Rio Grande River borders the park for 118 miles. An additional 127 miles of river downstream has been designated Rio Grande Wild & Scenic River, which is managed by the National Park Service. River trips at both locations require a free permit available at any of the visitor centers. Equipment rental and hired are available from private companies nearby. More on River Trips. Hiking is the best way to experience, enjoy, and appreciate Big Bend National Park. 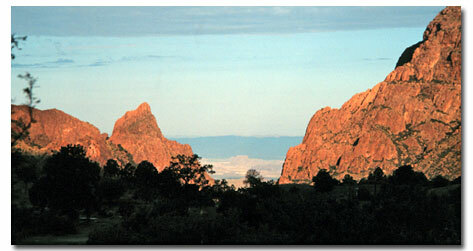 There are over 150 miles of hiking trails through desert and mountains. Cross-country hiking is permitted. A permit is required for all overnight trips, and can be obtained up to 24 hours in advance of the trip in person only. It is virtually impossible to plan an extended backpacking trip prior to your arrival in the park. Bear in mind how much distance you want to cover and how much time you have. Based on that information and current conditions, personnel at park visitor centers can assist you with trip planning. Thoughts of spring wildflowers usually bring visions of lush hills and meadows with picturesque streams. Not the desert. Certainly not arid West Texas. Yet by April, especially in years following a wet autumn, wildflowers and cacti turn the rugged landscape of Big Bend National Park into a palette of rainbow hues. And migrating birds add their colorful magic to the trees and thorn-covered vegetation. More..
With a slight breeze cooling our faces and the morning sun warming our backs, my horse gives a little spurt and powers up the rocky slope. The woody stalks of lechugilla  or "lechu-get'cha" as locals call the spiny plant  cast long shadows across the hardscrabble landscape. Prickly pears and creosote bushes dot the sandy arroyos and worn-down hills. In the distance, the Chisos Mountains in Big Bend National Park float on the horizon like a purple cloud. More..